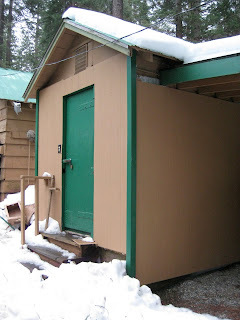 Camp Wawona's freezer miraculously stayed within legal temperature ranges for the duration of the power outage caused by January's snow storms. With power restored, CW staff faced a new problem: the freezer wasn't cooling...at all. It seems that as Generator 1 failed because of the heavy electrical load it was carrying (due in large part to the unexplained failure of Generator 2) buildings camp-wide experienced electricity fluctuations commonly known as "brown outs". The power fluctuations caused the freezer compressor burn out, damaging it beyond repair. Food Service Director Paulette Bair wasn't excited about the $3,000 bill but was even less excited by the idea of not having a freezer. With the part taking almost another week to arrive and be installed, God continued to preform a miracle and keep the freezer within legal temperatures in spite of daily highs in the mid 40's. The freezer is up and running again after a new compressor was installed, but camp staff will not soon forget the mighty example of God's grace and power. The burnt out compressor on the back of the freezer. 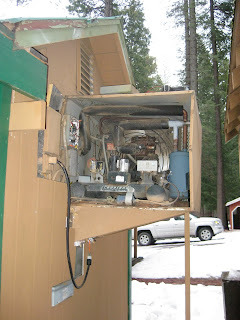 Camp Wawona's freezer miraculously stayed within legal temperature ranges for almost two weeks without a cooling system.